Prosperity comes again and the Cold War ends. Plus there's Olympic triumphs and controversy, the personal computer age born, and a Supreme Court justice with a difference. Exxon Valdez spill in Alaskan waters raises concerns about the environmental impacts of man-made disasters on our natural lands and waters. 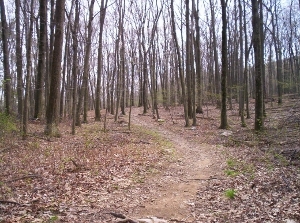 Take a trip along the Appalachian Trail. 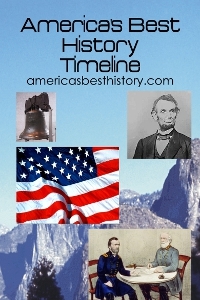 There are a myriad of National Park and other historic sites either on the trail or just nearby. From Acadia National Park in Maine to Harper's Ferry National Historical Park in West Virginia, plus other Civil War sites nearby, down to Georgia. So you can take a hike, visit some history, and see a whole lot a nature and beauty along the way. Photo above: President Ronald Reagan. Courtesy Department of Defense, Department of the Navy, Naval Photographic Center. 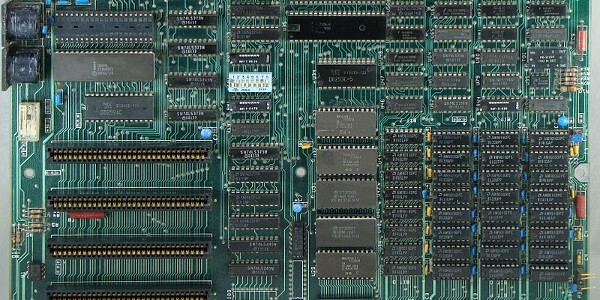 Right: IBM PC circuitboard for the 5150. Courtesy Wikipedia Commons. January 4, 1980 - President Jimmy Carter announces the embargo on sale of grain and high technology to the Soviet Union due to the Soviet invasion of Afghanistan. February 13, 1980 - The opening ceremonies of the 1980 Winter Olympics Games are held in Lake Placid, New York. 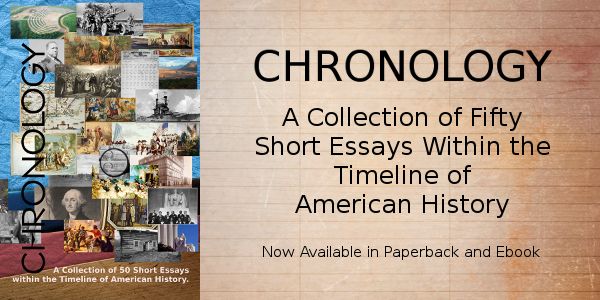 One of the most thrilling moments include the Miracle on Ice when a team of U.S. amateur ice hockey players defeated the vaunted Soviet Union professional all-star team in the semi-final game, then won the gold medal over Finland. U.S. speed skater Eric Heiden also concluded one of the most amazing feats in sports history when he won all five speed skating medals from the sprint at 500 meters to the marathon 10,000 meter event. April 1, 1980 - The 1980 census shows a population in the United States of 226,542,203, an 11.4% increase since 1970. For the first time, one state had over 20 million people living within its borders, the state of California with 23.7 million. Due to a trend of western migration, Missouri now contained the geographic population center of the United States, one quarter mile west of De Soto in Jefferson County. April 12, 1980 - The United States Olympic Committee, responding to the request of President Jimmy Carter on March 21, votes to withdraw its athletes from participation in the Moscow Summer Olympic Games due to the continued involvement of the Soviet Union in Afghanistan. April 24-25, 1980 - The attempt to rescue the American hostages held captive in the U.S. Embassy in Iran fails with eight Americans killed and five wounded in Operation Eagle Claw when a mid-air collision occurs. May 18, 1980 - The Mt. St. Helens volcano, in Washington State, erupts, killing fifty-seven people and economic devastation to the area with losses near $3 billion. The blast was estimated to have the power five hundred times greater than the Hiroshima atomic bomb. October 10, 1980 - President Carter signs legislation establishing Boston African American National Historic Site, which includes the oldest black church in America and other historic sites of the Black Heritage Trail in Boston, Massachusetts. November 4, 1980 - Ronald Reagan, the former Republican governor of California, beats President Jimmy Carter and independent candidate John B. Anderson, also a Republican, in a landslide victory, ousting the incumbent from office. The victory in the Electoral College, 489 to 49, as well as an 8 million vote margin in the popular vote over Carter, ensured a mandate for the new president. January 20, 1981 - The inauguration of Ronald Reagan as the 40th president of the United States occurs in Washington, D.C. It was followed by the release of the fifty-two Americans still held hostage in Tehran. The Iranian hostage crisis, which lasted four hundred and forty-four days, was negotiated for the return of $8 billion in frozen Iranian assets. March 30, 1981 - President Ronald Reagan withstands an assassination attempt, shot in the chest while walking to his limousine in Washington, D.C.
April 12, 1981 - The first launch of the Space Shuttle from Cape Canaveral and the Kennedy Space Center occurs as Columbia begins its STS-1 mission. The Space Shuttle is the first reusable spacecraft to be flown into orbit, and it returned to earth for a traditional touch down landing two days later. July 29, 1981 - Tax cut legislation proposed by President Ronald Reagan, the largest in history, is passed by both houses of the U.S. Congress. It would reduce taxes by $750 billion over the next five years. August 12, 1981 - IBM introduces the IBM-PC personal computer, the IBM 5150. It was designed by twelve engineers and designers under Don Estridge of the IBM Entry Systems Division. It sold for $1,565 in 1981. September 21, 1981 - Sandra Day O'Connor is approved unanimously, 99-0, by the United States Senate to become the first female Supreme Court associate justice in history. January 8, 1982 - ATT settles its lawsuit with the U.S. Justice Department. The agreement forced the independence of the twenty-two regional Bell System companies in return for expansion into the prohibited areas of data processing and equipment sales. March 2, 1982 - The Senate passes a bill that virtually eliminated the practice of busing to achieve racial integration. May 1, 1982 - The Knoxville World's Fair opens on the topic of energy by President Reagan. A special category exposition sanctioned by the Bureau of International Exhibitions, the Knoxville event would draw over eleven million people to the Tennessee valley over the next six months. November 5, 1982 - The highest unemployment rate since 1940 is recorded at 10.4%. By the end of November, over eleven million people would be unemployed. November 13, 1982 - The Vietnam Veterans Memorial is dedicated in Washington, D.C., holding the names of the more than 58,000 killed or missing in action during the conflict. March 23, 1983 - The initial proposal to develop technology to intercept incoming missiles, the Strategic Defense Initiative Program, or Star Wars, is made by President Ronald Reagan. 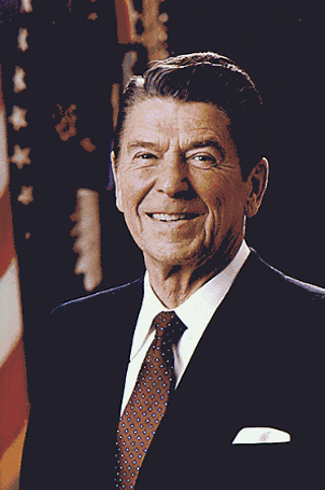 April 20, 1983 - President Reagan signs legislation meant to rescue the Social Security System from bankruptcy. 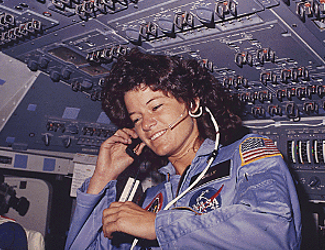 June 18, 1983 - Astronaut Sally Ride becomes the first American woman to travel into space. October 23, 1983 - A terrorist truck bomb kills two hundred and forty-one United States peacekeeping troops in Lebanon at Beirut International Airport. A second bomb destroyed a French barracks two miles away, killing forty there. October 25, 1983 - The United States invasion of Grenada occurs at the request of the Organization of Eastern Caribbean States to depose the Marxist regime. February 7, 1984 - Navy Captain Bruce McCandless and Army Lt. Colonel Robert Stewart become the first astronauts to fly free of a spacecraft in orbit during a space shuttle flight that began four days earlier. May 12, 1984 - The Louisiana World Exposition of 1984 opens along the Mississippi River waterfront in New Orleans. The event, the last world's fair held in the United States, was plagued with financial trouble, and drew significantly fewer visitors than predicted over the next six months, 7.3 million, although it was regarded as the catalyst in the recovery of the waterfront and warehouse district to public use. July 12, 1984 - Democratic candidate for President, Walter Mondale, selects Geraldine Ferraro as his Vice Presidential running mate, the first woman chosen for that position. July 28, 1984 - The opening ceremony of the Los Angeles Olympic Games is held. The games run by Peter Ueberroth, prove a financial and U.S. success, despite a retaliatory boycott by most allies of the Soviet Union due to the U.S. boycott of the 1980 Moscow games. November 6, 1984 - President Ronald Reagan wins reelection over Democratic challenger Walter F. Mondale, increasing his Electoral College victory since the 1980 election to a margin of 525 to 13. July 13, 1985 - A famine relief concert organized by British artist Bob Geldof and held simultaneously in London and Philadelphia is seen in one hundred and fifty-two countries. The seventeen hour concert raised $70 million for relief efforts in Ethiopia and other African nations. September 11, 1985 - Pete Rose breaks Ty Cobb's record for most career hits in Major League Baseball history. He would be banned from baseball in 1989 for gambling, thus making him ineligible for election into the Baseball Hall of Fame in Cooperstown, New York. November 19, 1985 - The first meeting in six years between the leaders of the Soviet Union and the United States occurs when Mikhail Gorbachev and Ronald Reagan engage in a five hour summit conference in Geneva, Switzerland. November 20, 1985 - The first version of the Windows operating system for computers is released. December 11, 1985 - General Electric Corporation agrees to buy RCA Corporation for $6.28 billion in the largest corporate merger ever outside the oil industry. January 20, 1986 - Martin Luther King Day is officially observed for the first time as a federal holiday in the United States. January 28, 1986 - The Challenger Space Shuttle explodes after lift off at Cape Canaveral, Florida, killing seven people, including Christa McAuliffe, a New Hampshire school teacher. May 25, 1986 - Five million people make a human chain across the United States in the Hands Across America campaign to fight hunger and homelessness. September 18, 1986 - A tentative agreement on a world-wide ban on medium-range missiles is reached between the Soviet Union and the United States. This agreement would not be expanded to include long-range missiles when President Reagan refused capitulation to the demand from Mikhail Gorbachev to limit development of the Star Wars missile defense shield. November 3, 1986 - The first reporting of the Iran-Contra affair, diverting money from arm sales to Iran to fund Nicaraguan contra rebels, begins the largest crisis in the Reagan tenure. August 12, 1987 - Near the end of hearings into the Iran-contra affair, President Reagan admits to a policy that went astray, but denied knowledge of the diversion of funds to the contras. October 19, 1987 - The stock market crash known as Black Monday occurs on the New York Stock Exchange, recording a record 22.6% drop in one day. Stock markets around the world would mirror the crash with drops of their own. October 23, 1987 - The President's nominee to the Supreme Court, Robert Bork, is rejected by the U.S. Senate, 58-42, in the largest margin of rejection for the role in history. December 8, 1987 - The United States and the Soviet Union sign an agreement, the Intermediate Range Nuclear Forces Treaty, to dismantle all 1,752 U.S. and 859 Soviet missiles in the 300-3,400 mile range. December 31, 1987 - El Malpais National Monument in New Mexico is established by legislation. It preserved a natural volcanic area, a seventeen mile lava tube system, and remains from the Pueblo Indian culture. February 3, 1988 - The United States House of Representatives rejects the request of President Reagan for $36.25 million to fund the Nicaraguan Contras. April 12, 1988 - The first patent for a genetically engineered animal is issued to Harvard University researchers Philip Leder and Timothy Stewart. May 4, 1988 - The deadline for amnesty application by illegal aliens is met by 1.4 million applications. It is estimated that 71% of those who applied had entered the United States from Mexico. October 31, 1988 - Poverty Point National Monument in Louisiana is established by President Ronald Reagan in order to preserve some of the most extensive earthworks from prehistoric times in North America. November 8, 1988 - Vice President under Ronald Reagan, George Herbert Walker Bush, claims victory in the presidential election over Democratic challenger Michael S. Dukakis, Governor of Massachusetts. The Electoral College vote tallied 426 for Bush and 111 for Dukakis. January 6, 1989 - Economic reports on the previous year from the Labor Department indicate a growth rate of 3.8%, the largest in four years and an unemployment rate of 5.3%, a low of fourteen years. March 24, 1989 - The Exxon Valdez crashes into Bligh Reef in Alaska's Prince William Sound, causing the largest oil spill in American history, eleven million gallons, which extended forty-five miles. August 9, 1989 - The Savings and Loan Bailout is approved by Congress and signed into law by President George Herbert Walker Bush. The total cost of the bill would approach $400 billion over thirty years to close and merge insolvent Savings and Loans. August 10, 1989 - Army General Colin Powell is elevated to the position of Chairman of the Joint Chiefs of Staff, becoming the first African American to be nominated to that post. November 9, 1989 - The Berlin Wall, after thirty-eight years of restricting traffic between the East and West German sides of the city, begins to crumble when German citizens are allowed to travel freely between East and West Germany for the first time. One day later, the influx of crowds around and onto the wall begin to dismantle it, thus ending its existence. Sally Ride, America's first woman astronaut, communities with NASA from the flight deck of the Challenger Space Shuttle, June 18-24, 1983. Photo: U.S. Information Agency. 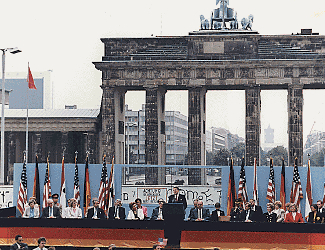 President Reagan at the Berlin Wall. 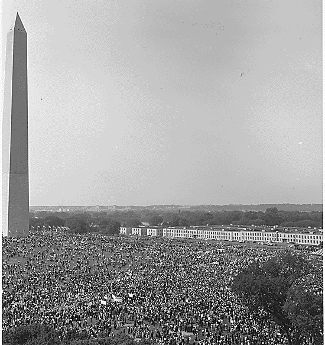 Courtesy National Archives.